Because of capacity restraints, we are currently not accepting Post-Baccalaureate applications. Prior to taking our Anatomy & Physiology of Speech and Hearing class students must have completed a general human anatomy & physiology course. This may be done at any time prior to enrolling in the post-baccalaureate program. To meet national certification requirements of the American Speech-Language-Hearing Association, students must take at least one course in each of four areas of general study: Social Science (e.g., Introduction to Psychology), Biological Science (e.g., Human Anatomy and Physiology), Physical Science (Physics preferred, but Chemistry is acceptable) and Statistics (any introductory general statistics course). These courses are typically completed before beginning the post-baccalaureate program. Depending on a student's academic background, the courses may be completed during the post-baccalaureate program. To be considered for admission, applicants to the post-baccalaureate program must have earned an overall GPA of 3.0 or better in their previous academic studies. Truly special circumstances for lower GPAs should be addressed in the personal statement (see statement prompt below). Applicants seeking Pennsylvania teacher certification (as speech-language pathologists) must complete an approved teacher preparation program. At DU special education courses equivalent to GSPED 501: Exploring Inclusive Practices and GSPED 603: Response to Intervention are a required part of the post-baccalaureate program. Additional teacher preparation content is embedded in graduate speech-language pathology courses. Matriculation into our graduate program is guaranteed for students who successfully complete their post-baccalaureate program of study. Re-application is NOT required. The transition to our graduate program (professional phase) is seamless. 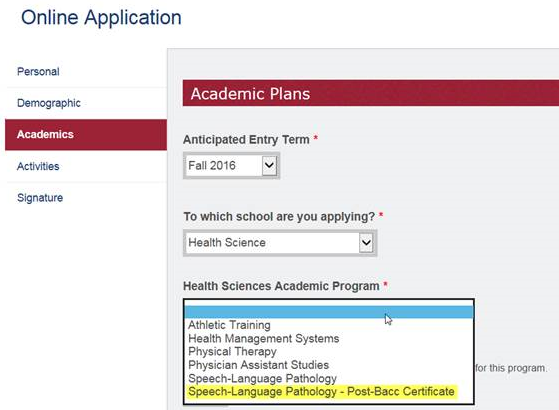 Application to Duquesne University’s post-baccalaureate SLP program is a three step process. "What are your career goals and how would the program at Duquesne University assist you in achieving those goals? Also, discuss anything in your background that you would like the admissions committee to understand." . Second, applicants must complete a free supplemental Duquesne University application. Please do not complete the supplemental application until after you have completed the CSDCAS application, and have paid the required fees to CSDCAS. The supplemental application allows us to process the CSDCAS application. There are a couple of important points for you to remember. Third, have official GRE scores sent by ETS to CSDCAS (Duquesne University Department of Speech-Language Pathology) using the Designated Institution code 0736. There is no minimum GRE requirement. Applications are reviewed holistically with GRE scores as one piece of information. An application is not complete until all three steps have been completed: (1) an application to CSDCAS including all transcripts (with Fall semester 2016 grades), letters of recommendation, and fees have been submitted; (2) a supplemental application to Duquesne University has been submitted; and, (3) official GRE scores are received by CSDCAS. The CSDCAS deadline for Duquesne University is February 1st. This is the last date when an applicant can submit their on-line application. If an applicant does not submit their on-line application prior to the deadline, they will not be able to apply to our program. PLEASE NOTE that the CSDCAS deadline is for a "Completed" application. This includes all transcripts, letters of recommendation, and payments. Before filling out the on-line application read the Frequently Asked Questions and Instruction pages on the CSDCAS web site. At Duquesne University post-baccalaureate students are classified as non-degree seeking until they matriculate into the graduate program. This may have financial aid implications. Applicants who plan to apply for financial aid are strongly encouraged to contact the Duquesne University Office of Financial Aid (412.396.6607) to discuss individual circumstances and the types and levels of financial aid that are available.